A high visibility convex traffic mirror offers increased effectiveness over an unbreakable traffic mirror in situations, or at intersections, where drivers are unfamiliar with the area. 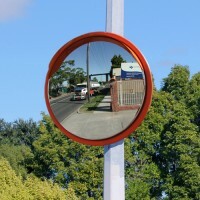 The bright colored orange surround makes this roadside mirror stand out in its environment. This traffic highway mirror is fitted with a stainless steel convex mirror face making it virtually unbreakable in most normal situations. Complete with 3" Clamp Bracket for pole mounting included. 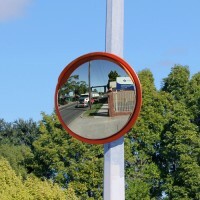 The high visibility powder coated orange finish and the galvanized steel materials used makes this a traffic mirror on a pole, that will last a very long time even when located in extreme conditions such as beaches, coast roads, ports or areas of high rain fall. The 24" High Visibility Convex Traffic Mirror offers increased effectiveness for an unbreakable traf.. TEMPORARILY SOLD OUT! 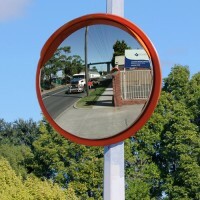 The 32" High Visibility Convex Traffic Mirror offers increased effectiveness .. The 40" High Visibility Convex Traffic Mirror offers increased effectiveness for an unbreakable traf..